Little Rock Arizona St. Arkansas St. The great Shalee Lehning, whose jersey is in the rafters, is K-State's all-time assists leader, with 800 assists. She's followed by Megan Mahoney with 589, Mary Jo Miller with 562, and then Kayla. KG made tremendous contributions to her teams, and leaves K-State with First Team All-Big 12 honors. 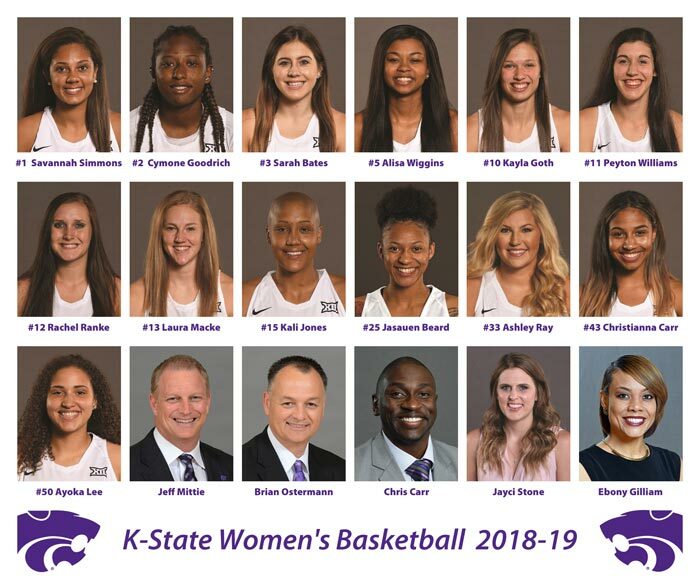 KSTATEFAN 28 has tweeted projections on K-State WBB's rosters over the next four seasons, assuming current players stay, and certain prized recruits sign with the Cats. 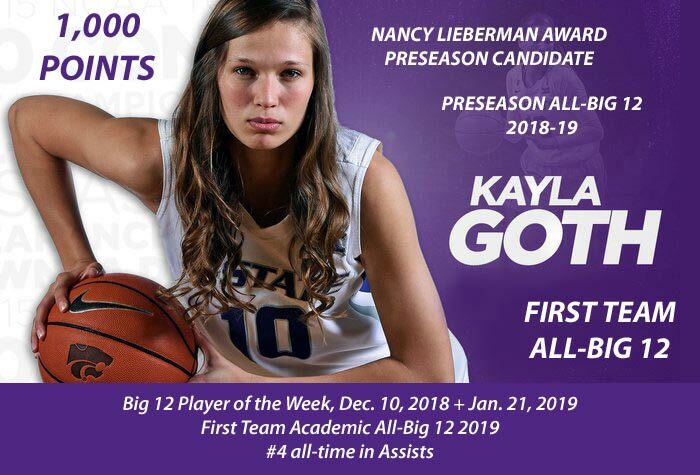 Today's K-State Sports Extra was written by our First Team All-Big 12, First Team Academic All-Big 12 point guard, Kayla Goth. She reveals a setback that all the fans I know never had a hint of, and along with injuries, how she got through everything. All I knew was she is focused, determined and smart, and has a very supportive family, who came from Wisconsin to home games on a regular basis. Don't miss this inspiring essay. Where would we be without K.G.? 3/18/19 Cats Headed to the 2019 NCAA Tournament! Here's video. I miss the Cats! Awards were presented to team members: Kayla Goth, who is First Team All-Big 12, received the Kendra Wecker Offensive MVP Award, as she led the Big 12 in assists. The Nicole Ohlde Defensive MVP Award was presented to Peyton Williams, who is First Team All-Big 12. She led the Big 12 in rebound percentage, and averaged a double-double this season. The Priscilla Gary Hustle Award went to Jasauen Beard, who came off the bench in many games and recorded impressive numbers. Rachel Ranke received the Tammie Romstad Durable Award. Kali Jones was named the 2018-19 Most Improved Player. Here's a good story by Jim Misunas of the Great Bend Tribune on Emily Ryan and the Central Plains Oilers' latest state championship. They're now at 111 straight victories! 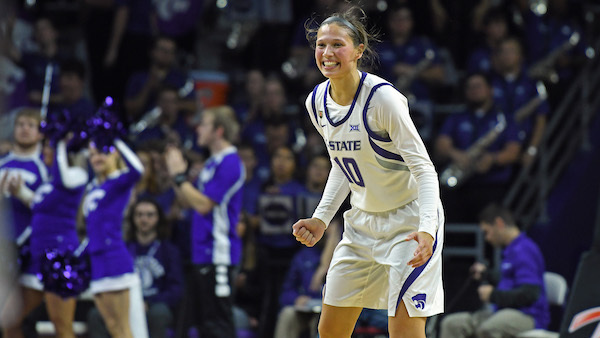 Here's the big news from the Big 12 Conference and K-State Women's Basketball. Here's the tournament announcement from the Big 12. The tournament runs from March 8 - 11 in Oklahoma City. Justin Toscano of The Manhattan Mercury has posted an exceptional feature on Kayla Goth, on the eve of her last home game. 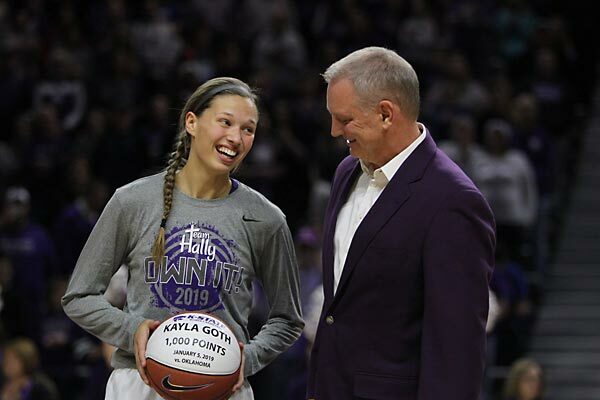 In this two-minute video on Twitter, senior point guard Kayla Goth, who needs no introduction, says, "Purple has meant a lot to me throughout my life. I wear it with pride." She reveals that her plan was to play closer to her home of DeForest, Wisconsin, but on her recruiting visit to America's #1 College Town, she fell in love with the place. All I want to know is, "Where would we be without K.G.?" Posted in a message board topic on tonight's loss to TCU is this YouTube video of the 2007-08 WBB Cats getting their championship rings. Hayes Gardner of highposthoops.com posted a story today that itemizes Kayla's stats, and supporting my catch phrase, "Where would we be without KG?" Corbin McGuire's Sports Extra looks at the outstanding 87-69 win over #11 Texas, along with Men's Basketball's simultaneous victory over #20 Oklahoma. 1/14/19 K-State's Kayla Goth scores 1,000 points vs. OU! That's right... 1,000 points in a game. Here's proof. (Click to enlarge.) Seriously, 1,000 career points is a great accomplishment, and her points scored plus assists this past two seasons have been critical to the Cats' success. We're very fortunate that she's on our side! D. Scott Fritchen has posted a fine story on Brittany Chambers to GoPowercat.com. Her jersey was very appropriately retired today. I was happy to be able to thank her for her 2,156 points today! Here's video from the halftime recognition and jersey retirement for #2 Brittany Chambers, the 5th of K-State WBB players to have this honor. Brittany's #2 jersey is headed to the rafters during the KU game. After her last season, she had a professional basketball career for a while, then returned to K-State briefly to put the finishing touches on her degree. She's now a second-year medical student. In her K-State career, from 2009 to 2013, she finished with 2,156 points... the third-most points in K-State WBB history. Her 42 points vs. Texas Southern on March 21, 2013 stands as the all-time K-State record. Brittany averaged 21 points-per-game. In her final season, she was named an AP Honorable Mention All-American. Look back at her impressive career in Corbin McGuire's K-State Sports Extra. 12/15/18 It's Coach Mittie's latest trick shot! Corbin McGuire's Sports Extra previews a special occasion for senior Kayla Goth, a native of DeForest, Wisconsin. On Sept. 16, the Cats will play Arizona State in La Crosse. KG's mother, Beth, is distributing 100 tickets! Coach Brian Ostermann put the event together, in cooperation with ASU, who also has some players from the area. 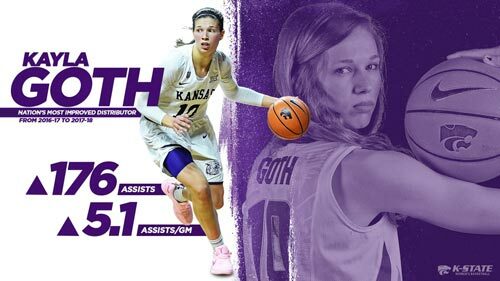 Here's an excerpt of the announcement from the Big 12 Conference: "Goth averaged 17.5 points, 6.5 assists and 4.5 rebounds in a pair of wins for the Wildcats last week. She scored 20 points and dished out 10 assists, while shooting 77.8 percent (7 of 9) from the field against Lamar. In the win at Little Rock, she boasted 15 points, six rebounds and three assists. The Player of the Week accolade is the first for Goth." Also, here's K-State's announcement. K-State Women's Basketball announced today that Cymone Goodrich has a shoulder injury that will prevent her playing the rest of 2018-19. We're very sorry about this setback, and wish her the best for a smooth recovery. The great Kindred Wesemann had a seat on the wrong end of the court on Nov. 18, as she's now the assistant coach for the Kangaroos. In Corbin McGuire's latest Sports Extra, we catch up with #24, certainly one of my all-time favorites. Coach Kindred and Coach Jacie ran a play that's a staple for Jeff Mittie's teams. He didn't mind that they used it, but was irritated that it worked! There's much more to this Sports Extra. We learn about Kindred's transition from player to coach, and coaching with Jacie Hoyt, who was her coach at K-State. Don't miss it! 11/16/18 Kansas State Women's Basketball Aims to "Leave No Doubt"
Here's a story from the Manhattan Mercury. K-State WBB announced two signings today. Emma Chapman is a 6' 2" forward from Columbia, MO. Jada Thorpe is a 5' 7" guard from Chicago. Kayla was moved to the point guard position last season, and she delivered an impressive number of assists. In a very open Sports Extra, she describes her goal to provide the best possible leadership, as well. 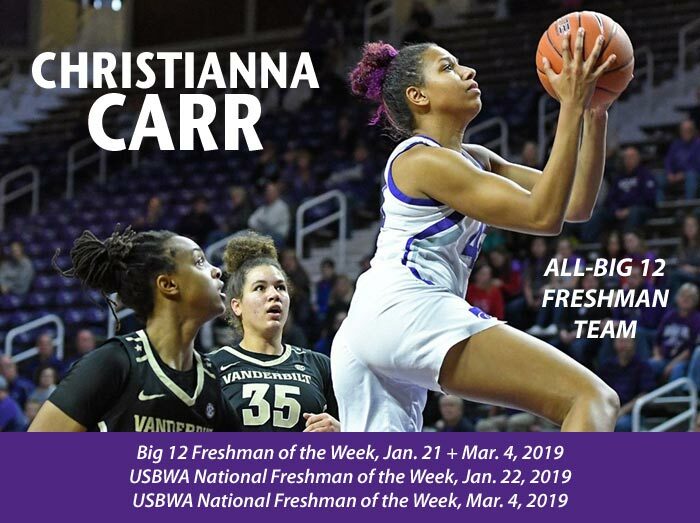 From the Manhattan Mercury, here's a good feature on Christianna Carr. Corbin McGuire's K-State Sports Extra is a look at how this year's new freshmen have worked to come together, while aware of their differences. They're keeping each other focused and headed toward success. Oh... that's just what the title says. Anyway, here you go! Rachel Ranke had quite a fine freshman season. She was Big 12 Freshman of the Week three times, and made the Big 12 All-Freshman team. She's the subject today of Corbin McGuire's Sports Extra. Ranke's goal is to diversify her shots. She's been in the gym alone, working on that, and she has practiced vs. MBB players on her inside game. The 2017-18 Big 12 Stats have Rachel as #27 in Scoring, and #2 in 3-Point Field Goals Made. We know she'll have another fine season! The Big 12 Conference has selected Kansas City to serve as the host site for the Phillips 66 Men's and Women's Basketball Championships in a multi-year agreement that will run from 2021-24. "Kansas City has become synonymous with Big 12 basketball," said Commissioner Bob Bowlsby. "The excitement around the men's championship is contagious with the crowds inside Sprint Center and the surrounding Power & Light District. We look forward to bringing our men's and women's championships back together, and continuing to build upon this atmosphere in Kansas City." Here is the complete release from the Big 12. The men's tournament will be in the Sprint Center, and the women's tournament will be in the Municipal Auditorium. 10/23/18 Brittany Chambers' Jersey to Be Retired! #2 is going to the rafters. Brittany Chambers, who's third on the K-State Women's Basketball career points list, will be honored on Jan. 13, after the KU game. I kept a database of her path to 2,156 points in her final season as a Cat. Here's K-State's release. Kindred Wesemann approves! This is nice, but hardly a surprise, considering Kayla's success last season as she switched to the point. Currently, she's on a list of 20 top point guards. As the season goes on, the list will be shortened to 10, and later five. An online fan vote in March will be part of the outcome. 10/16/18 Look at K-State's Non-Conference Schedule! Juniors Kayla Goth and Peyton Williams, who need no introduction, were recognized today. Kayla was named Preseason All-Big 12, and Peyton received Honorable Mention All-Big 12. Here's the complete release from the Big 12. Mini Camp was from September 28 to October 1... four hours per day. It was a first for Coach Mittie. Read all about it in the latest Sports Extra. 10/07/18 Laurie Koehn to the Kansas Sports Hall of Fame! Laurie Koehn was inducted into the Hall of Fame on October 7, 2018 in Wichita. They could not have found a harder worker or finer individual for the Hall of Fame! For some years, Laurie held the NCAA WBB record for career threes (392). • video: Laurie sinks 132 of 135 threes in 5 minutes in 2013! Peyton did this interview for NCAA.com (link) on balancing basketball and volleyball. 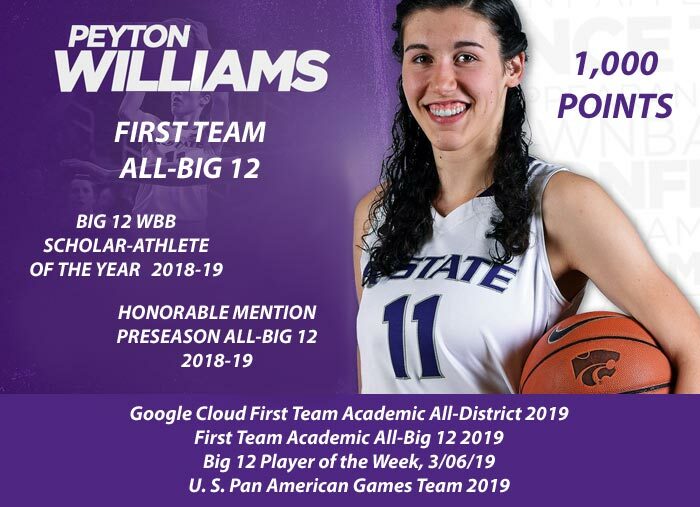 K-State Women's Basketball has tweeted a promotion to women's basketball media members to consider her for various awards in her senior season. Kayla's 11.7-points-per-game increase last season was the highest among all Power 5 schools. And... Kayla was named Academic All-Big 12 last season. Here's her roster page. I'm delighted to report that Laurie Koehn has a well-deserved selection to the Hall of Fame. (announcement) I've never respected a K-State Athlete more. She was well-known for her hard work, which resulted in her being the K-State and Big 12 all-time leader in three-pointers made (392), and she held the NCAA record for career three-pointers for a number of years. (link) Here's video of Laurie setting the NCAA record for three-pointers. Also, don't miss this from 2013: Laurie hits 132 of 135 three-pointers in five minutes. (video) Danielle Zanotti has play-by-play. 4/12/18 Shaelyn Martin: Big 12 WBB Scholar-Athlete of the Year! The Big 12 Conference has announced that Academic All-American Shaelyn Martin is the 2018 Big 12 Women's Basketball Scholar-Athlete of the Year. It's possible that this has something to do with her perfect 4.000 GPA, and being all-around awesome. Here's Kansas State's announcement. K-State WBB has proudly tweeted that Kayla Goth's increase from 50 to 226 assists in 2017-18 is the nation's best. What isn't mentioned is 1) Kayla's total of 226 assists is 2nd only to Shalee Lehning's 229 in 2008-09, 2) Kayla ended the season at #1 in assists in the Big 12 Conference and 3) she was also #6 in Big 12 scoring, and #7 in steals! She has been extremely valuable to her team. Powercat Sports Grill - 3011 Anderson Ave. at 6 P.M.
Tweet questions for Coach with #jeffmittieshow, or call 1-866-577-8228. Kids... just say no to KU.